As discussed last week when unveiling the communitheme snap for ubuntu 18.04 LTS, here is a suite of interview this week on some members of the core contributor team shaping this entirely community-driven theme. Last interview is from Aaron, godlyranchdressing on the community hub. Who are you? What are you doing/where are you working? Give us some words and background about you! I’m Aaron Papin and I’m from Trinidad and Tobago. I work at an IT consultancy that specializes in open-source solutions for SMBs. I’m a technician, but I also work in designing and deploying websites and even on ads from time to time. It’s pretty freeform and fun. I knew of Linux for years, but I only dove in after a hard drive failure a couple years ago. Because why not at that point? It didn’t take me long to start using it mostly full time (games). Even though I’ve worked on my own themes in the past, I’m still pretty new to the Linux community. Hobby-wise, I really like TV, cooking, video games and keeping fit when I’m not on an “extended break”. What are you mainly contributor areas on communitheme? Developing. Though like most of the other developers on the communitheme, I also help out with contributing to the design aspect sometimes. How did you hear about new theming effort on ubuntu, what made you willing to participate actively to it? Before it was cancelled, I was looking forward to Suru/Unity 8 so the news about that was really disappointing. That disappointment eventually led to me working on the United theme and I was asked to help out through my work on that. It sounded like fun and the atmosphere was great. The excitement was (and still is) contagious. It’s turned out to be a really good way to learn as well. How is the interaction with the larger community, how do you deal with different ideas and opinions on the community hub, issues opened against the projects, PR? I’d say it’s great, especially now that we have a lot more contributors since the decision to not ship the theme in 18.04. Times can be difficult as almost everything is done by consensus and everyone has their own opinions, but I think we all take feedback in stride and try to accommodate it. That aside, color is a really hot topic. What did you think (honestly) about the decision for not shipping it by default on 18.04, but curating it for a little while? Do you think the snap approach for 18.04 will give us more flexibility before shipping a finale version? I was disappointed. I remember used to say to the other guys that we have more than enough time to make it into 18.04 and then nope. It’s for the best though, and yeah, I think the snap package will make it easier for people to use regardless of it’s the default or not. Any idea or wish on what the theme name (communitheme is a codename project) should be? This is unoriginal but I really liked Stefan’s “Atmosphere” so maybe Atmos? Any last words or questions I should have asked you? Can I give a shout out? :) Shout outs to CDrummond, nana-4, NusiNusi and everyone else who’s helped us out with their contributions. 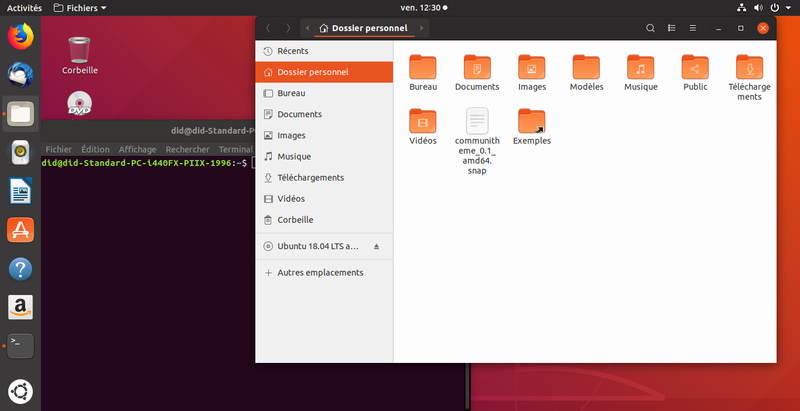 And if you are on Ubuntu 18.04, feel free to install the snap, select the communitheme session, give feedback on the community HUB, start contributing and having fun! You too can shape the future desktop look of Ubuntu! Participate and be part on your discussion on our Community HUB dedicated topic! (The preview isn't availabel yet and will soon be fixed by our IS team).